Sams says, based on internal documents, Microsoft is planning to release three new Surface devices, with the codenames Carmel, Andromeda, and Libra. 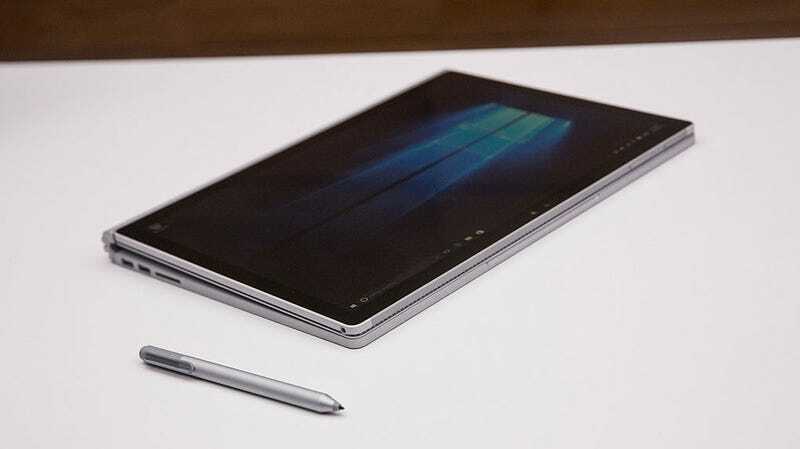 The Surface Pro 6 (codename Carmel) might not arrive this year, and, according to ZDNet, could be the recipient of a major redesign. It’s the only device of the three one might consider an update, as the other two attempt to fill out the spaces Microsoft is missing with its high-end devices. Oh No, Is Microsoft Going to Make Another Damn Dual-Screen Gadget? The Libra is reportedly the codename for Microsoft’s low-cost tablet, meant to help the company grab a bit of market share where companies like Google and Apple reign supreme through the sale of inexpensive Chromebooks and iPads, respectively. Microsoft’s device reportedly uses a 10-inch display, and has a starting price of around $400, making it a tad more pricey than its competition. Andromeda could be the mythical dual-screen device Microsoft has been teasing since the Courier was uncovered in 2009 (and then killed), and could debut as early as this year. But whether or not Microsoft is ready to try and usher in the age of dual-screen computing, other companies are already prepping for the future. Keyboard-free notebooks stole the show at this year’s Computex, with companies like Asus and Lenovo showing off concept notebooks. Asus’ Project Precog notebook is a convertible notebook with two identical 4K touchscreen displays, in addition to Intel’s machine vision processing unit. That means Project Precog will be watching your hands with its integrated camera, and attempt to figure out what you’re doing with your hands and render the appropriate interface, which should reduce overall power draw. The Yoga Book 2, shown by Lenovo, builds on the progress made with its first Yoga Book, and uses two displays instead of one display paired with a touch-friendly keypad. Intel, king of concept devices, showed off its own dual-screen “Tiger Rapids” notebook, which uses a traditional 7.9-inch LCD touchscreen and an identically sized E Ink touchscreen for writing, scribbling, and doodling without killing your battery. Microsoft’s Andromeda device is reportedly sticking with two identical touchscreens rather than the LCD-E Ink pairing, but Intel’s version could be adopted by manufacturers looking to get ahead of the game and create offerings similar to Microsoft’s Andromeda device.